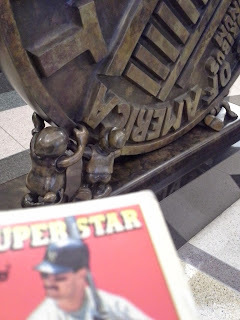 I went to the flea market today to buy a belt, and decided to check out the baseball card vendors. Back when they were on the mezzanine I used to get cards there all the time. Around the time they moved to the basement I stopped because there wasn't much good that was reasonably priced left. Today when I went down to the basement they were gone. Turns out they were back up on the mezzanine, though in a much smaller space. 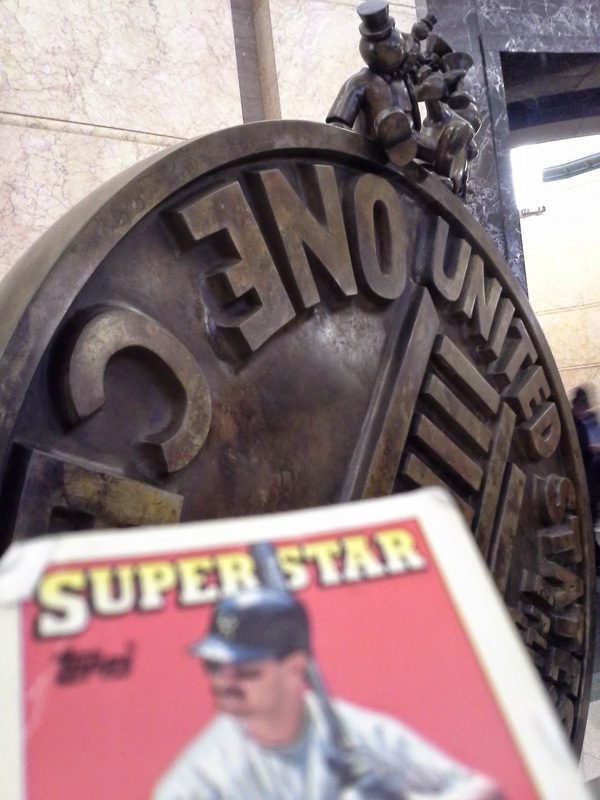 But one of my regular guys from years ago, Vinnie, was still there and he had an actual dime box! And it wasn't crap either. Years ago I had bought a couple of dime boxes off of him, at a $10 a row rate. I asked him if I could get this one for $20 and he said "sure". That's a pretty nice haul for $20, even though half of the second row was basketball. Probably around 2000 baseball cards in the box so that's about ten cards a penny. That Kent Hrbek/Tim Laudner rookie is up for trade. So are all of those 2007 Topps cards. I've been getting a ton of '07s from my NYC vendor as well. I completed that set very quickly for a modern set and see it everywhere. Did that set have an unusually high printing run? Here are some highlights of the good stuff. There were two copies of this Jeff Montgomery minor league card (so one is up for trade). I love that the card has the photographer's name and number. Even cooler is that almost 30 years later Alan Loveless is still a photographer and is still at that phone number (now augmented by a website; it's not 1987 anymore). Coolest of all is that last year he made news for saving a woman's life after she crashed her card into a pond where Loveless was doing a photo shoot. A nice thing about this box compared to some of my other recent acquisitions is that the stars weren't weeded out (though there weren't too many Yankees or Mets). Lots of '97 UD in the box. You can't tell from the photo but this Leaf Dante Bichette insert is textured and kind of feels like a dress shirt. Lots of minor league cards in the set, which are great for some wackiness. This was a neat oddball. I had no idea 7-11 was doing discs as late as 2000. Just included this card because of the great photo, both of Karkovice and the fans in the background. If you like photos like that then you would love Collectors Choice. Tons of '97 CC in the box and I already have the full set so all are up for trade. There was a lot of Topps Chrome which was very cool, including this refractor of former Yankee Miguel Cairo. Thought there would be only one textured Dante Bichette insert? Then you were wrong. All hail the RBI King. Speaking of textured inserts, this one is pretty cool. Lots of cool minor league cards. Hard to read in the picture but LaTroy's hat says "Hawk - Top Dawg". Here's a pretty awesome dime box get, a rookie-year A-Rod. Really good find from a dimebox. A street box with "minis"
Back when I started buying those $3 boxes from Al he said that if I bought them all he would "throw in some minis". I don't think he's done with the boxes but he threw in the envelope yesterday anyway. Yeah not exactly Allen & Ginter here. Still, I suppose I might need some of the '90 Score MVPs. Does anyone collect these? The sticker cards still have the stickers on them. I might be interested in trading for some sticker books that don't have the stickers in them. Unfortunately I did not keep the ones I had when I was a kid, but I've accumulated a fair amount over the years. He also threw in what I guess you would call some "Maxis". The Jeff Conine card on the bottom right is a standard sized card. The other cards are all considerably larger. There were triplicates of the Ben Grieve so two are also up for trade. The autographed basketball card is also up for trade. It's a bit beat up, but it comes from a 1995 Classic autograph set, so it should be legit, at least. Arthur Agee never played in the NBA but was the subject of a well-known documentary film called "Hoop Dreams". There was a lot of junk wax (but much more good stuff). Unless someone wants these (lots of 90 UD here) I am going to try one more stab at #RandomActsOfCardness. Maybe with a bigger selection I'll get someone willing to put it up on twitter. Walt Weiss rookie card anyone? I read about this sign on Ephemeral New York and was intrigued enough to want to check it out. Very obscure but just the thing I like. 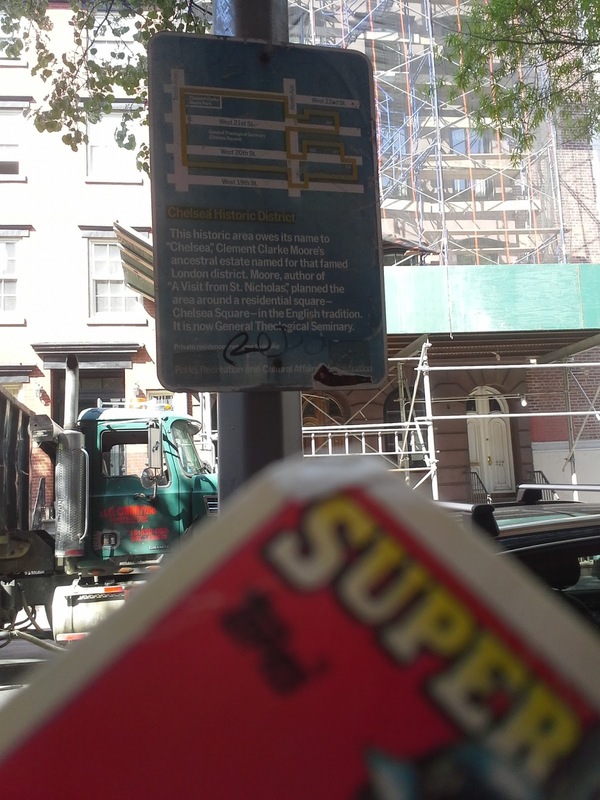 It is a street sign put up by the Landmarks Preservation Commission back in 1970 about the Chelsea Historic District. It is very 1970s-looking in color and font, and it is pretty amazing it is still up 45 years later. Fun to see something like that hanging around instead of being replaced by something more modern and bland. Comparing this photo to the one Ephemeral NY took in 2013, it looks like someone has been taking care of the sign - the stickers in the 2013 picture have been removed (though a new one has been added) and it has been moved about a foot higher on its pole. I have eleven cards of Billy Brewer. This one is from 1993 O-Pee-Chee Premier. Playing career: Billy Brewer spent seven years in the major leagues with the Royals, Yankees, A’s and Phillies (but never the Brewers). In 203 games he went 11-11 with 5 saves and a 4.79 ERA. He did pitch in fifteen games against the Brewers, saving one game, with a 1.72 ERA. Where he is now: Senior Director of Player Personnel & Baseball Operations for the Waco Storm youth team. 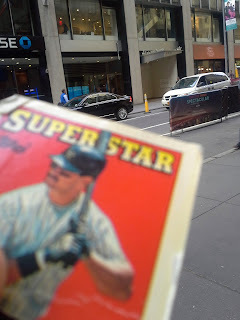 My memories: He shared his thoughts on baseball cards with this blog in 2009. Google Autocomplete results: He is seventh when you type Billy Bre, between Billy Bremner Guitarist, a member of the band Rockpile, and Billybrew, a home beer brewing website. The first entry when you google Billy Brewer is not the baseball player but the former head football coach at Ole Miss. Coming up next: The next profile will be Charles Brewer. Second baseman Danny Garcia played for the Mets in 2003 and 2004. In 77 games he hit .227 with 5 HR and 23 RBI. Now the owner and performance coach at SportsEast Performance at The Hitting Academy in Tampa, he kindly answered my questions about baseball cards. "Favorite stories about a card? ... The card where I'm rounding third was of me hitting my first HR off Mark Redman of Marlins. Favorite card? ... is a card that says my name on it, but it's a picture of my friend and teammate Jorge Velandia. It's hilarious. Do I collect? ... I collected my entire childhood, loved it. Had Griffey and Ichiro rookie cards ... miss those days!" Toots Shor's was the biggest celebrity restaurant/bar in New York in the 1940s and 1950s. Regulars included movie stars like Jackie Gleason, Frank Sinatra and Marilyn Monroe as well as baseball stars like Joe DiMaggio and Mickey Mantle. My personal favorite story about the place was the time Shor introduced Yogi Berra to Ernest Hemingway. Told that Hemingway was a famous writer, Yogi supposedly asked him, "What paper do you write for, Ernie?" The location of the restaurant at 51 W. 51st Street is now an outpatient facility for Columbia University Medical Center. 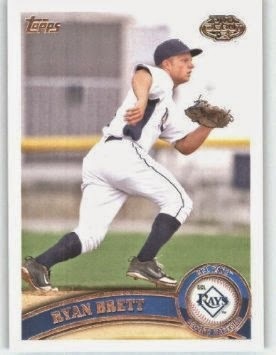 I have one card of Ryan Brett, from 2011 Topps Pro Debut. Playing career: Second baseman Ryan Brett was the Rays’ third round pick in the 2010 draft and has moved his way through the organization. In 2014 at AA Montgomery he hit .303 with 8 HR, 38 RBI and 27 SB. Where he is now: Brett made his major league debut on April 18 against the Yankees, flying out in a pinch-hit at-bat against Masahiro Tanaka. Three days later he made his first major league start at second base against the Red Sox, only to suffer a separated shoulder that forced him to the DL. Interesting facts: In 2012 he was one of three Rays minor leaguers suspended for methamphetamine use, which Brett claimed came from an Adderall medication. Google Autocomplete results: He is sixth when you type Ryan Bre, between Ryan Brennan & Donnelly, a law firm in Floral Park, NY, and Ryan Brenzier Reviews, referring to a wedding photographer. Another prominent Ryan Brett is a film editor. Coming up next: The next profile will be Billy Brewer. Back when I started doing the wallet card photos around Manhattan, I solicited requests (still open to any I get). Steve of The Greatest 21 Days suggested I check out a website called Roadside America. I did and found several interesting objects I was unaware of. 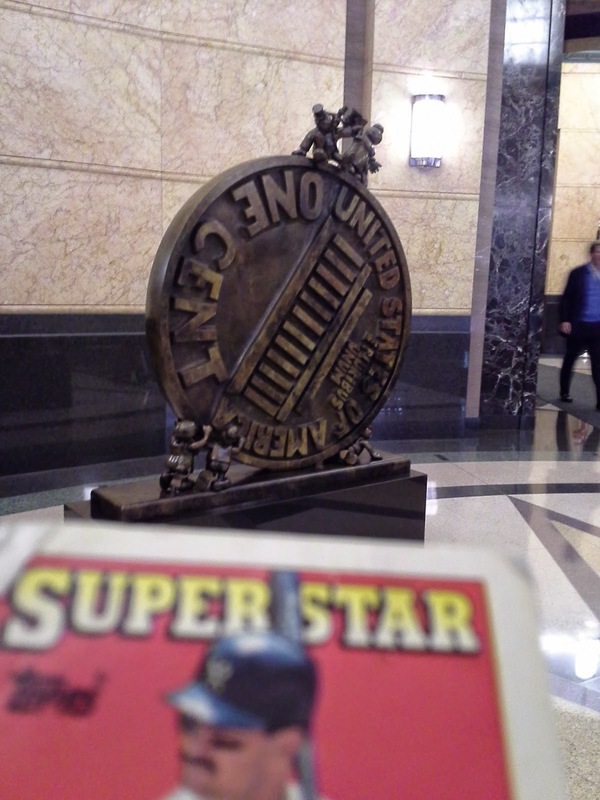 Perhaps the coolest was a sculpture called Big, Big Penny that is in a hotel lobby on 53rd Street. A statue of a giant penny is weird enough but what makes it really cool are all the little characters around it. I have seven cards of Ken Brett. This one is from 1982 Fleer. 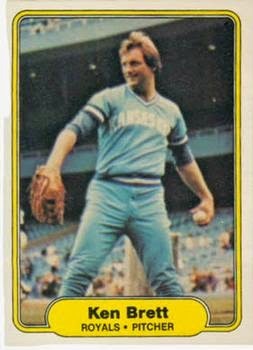 Playing career: The older brother of Royals’ star George Brett, Ken Brett was a decent pitcher best known for pitching for ten teams in his fourteen-year MLB career, a record at the time. His best season was 1974, when he was an All-Star for the Pirates, going 13-9 with a 3.30 ERA. Overall he was 83-85 with a 3.93 ERA. Post-baseball career: He was involved in a number of sports business ventures, both on his own and with his brothers. He died of cancer in 2003. Google Autocomplete results: He is third when you type Ken Br, between Ken Brody, Co-Founder of Taconic Capital, and Ken Brown, an artist. Another prominent Ken Brett is State Manager at Gordon Brothers Industries. Coming up next: The next profile will be Ryan Brett. An early Melvin Upton Jr. gold signature card. People who only knew him as BJ were probably confused by this signature. Pretty cool to get Topps Finest in one of these boxes. This was really interesting - some kind of late '80s "Broder" card. The back just says "Sample". Does anyone know anything about this card? I can find nothing online. This black-bordered parallel of Kevin Correia's 2009 Topps Traded card says "58 years of collecting" and is numbered 11/58 on the back. 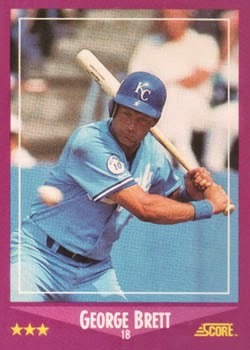 I have 126 cards of George Brett. This one is from 1988 Score. Playing career: Arguably the greatest third baseman of all time and definitively the greatest Kansas City Royal of all time, Hall-of-Famer George Brett is one of four players all-time to hit .300 with 3000 hits and 300 home runs, the only player to win a batting title in three decades, and a 13-time all-star. Probably his most well-known accomplishment was his run at a .400 batting average in 1980. He finished at .390, led the league in both on-base and slugging percentages, and was the only player to have an OPS+ higher than 200 (203) between 1970 and 1991. Where he is now: He is the VP, Baseball Operations for the Royals, and was prominent on TV during Kansas City’s surprise playoff run last year. Also with his brother Bobby (and formerly, his late brother Ken) he owns a sporting company called Brett Performance Sports, formerly known as Brett Bros. Brett Bros. was sued in 2012 for false advertising over the health benefits of their bracelets and necklaces. The suit was settled out of court. My memories: When I think of Brett my first thought is the pine-tar game. Only against the Yankees can a player clearly break the rules and then get away with it. Still a very entertaining saga even if it was a bit before my time. By the time I was following baseball he was more of an elder statesmen, but he seems to have represented the Royals and baseball in general very well. I wonder if he is the best baseball player of all time to go by the name of George? George Ruth went by his nickname, and George Seaver and George Griffey use their middle names. Google Autocomplete results: He is first when you type George Br, ahead of George Brown College, a university in Toronto. There do not appear to be any other prominent George Bretts. Coming up next: The next profile will be Ken Brett. There were several 2015 Bowmans, my first from the set. I may be in the minority but I like the new design. I love this shot of Tino Martinez hitting one out at Shea Stadium. Great angle, really great photo. This was the big hit of the envelope - a Mark Teixeira jersey card. He is one of my favorite Yankees so I was quite happy to get this. Alfonso Soriano is one of my favorite all-time Yankees. I have the base version of this card but the Opening Day version was new to me. 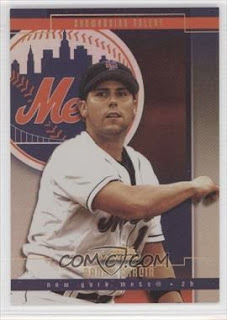 This shiny card of Xavier Nady was the most eye-catching card in the envelope. 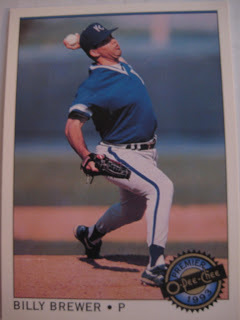 I have one card of Jason Brester, from 1996 Topps. 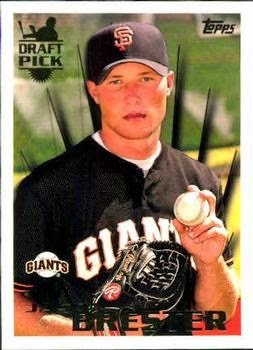 Playing career: Jason Brester pitched in the Giants, Rockies and Phillies organizations from 1995 to 2000. In 137 games he went 44-43 with a 4.09 ERA. Where he is now: A dentist in Seattle. Google Autocomplete results: He is first when you type Jason Brest, ahead of Jason Brest, former head greenkeeper at the Port Macquarie Bowling Club in New South Wales. There do not appear to be any other prominent Jason Bresters. Coming up next: The next profile will be George Brett. The rare "Yankee card I did not have." He must have missed this while pulling out the NY teams. Cody Ehlers made it as far as AA in his five year career. Score had some of the best parallel sets of the 1990s. Instead of a little bit of gold foil, they covered the whole thing! I think 2014 Topps is the most recent I've seen in these boxes. This box was pretty bad, filled almost entirely with junk wax. I told Al I wasn't interested in this one but he offered to take $2 for it, and there was a small handful of Upper Deck Vintage in there, so I decided to take it for $2. There ended up being only about 20 cards that were not junk wax, so I think $2 was a fair price. Everyone remembers Jim Abbott, the first major league pitcher with one hand. No one remembers that Chad Bentz was the second. I had never even heard of the guy until well after his career ended. This is a pretty cool looking insert, from 1995 Fleer. This was a real oddball find, "Yahoo Presents Rawlings". There were Fact Cards #1 and #2 about the making of baseball gloves.